Tesla originally released Autopilot in late 2014 and has been pushing the envelope of self-driving capabilities ever since. While new Tesla vehicles do come standard with basic safety features, the true self-driving characteristics come into play with the Autopilot and, in particular, the Full Self-Driving option which was brought back in early 2019 – see our Full Self-Driving is back article. Since the original Autopilot (dubbed Hardware 1 or AP1) there have been a couple updates (AP2 and AP2.5) and new major update called Hardware 3 (AP3) coming in 2019. This article breaks down the differences in each one. First, before we dive into the different Autopilot versions, it’s important to explain what Autopilot means. In general, Autopilot on Tesla is the basic optional package that allows the vehicle to follow other vehicles and auto-steer in a lane, primarily on freeways (although it technically can also be used on city streets). There are many other cars with autopilot, but only Tesla offers the more advanced Full Self-Driving package where the vehicle has far more advanced semi-autonomous features. It’s important to note that this is not autonomous driving, but instead what’s called Level 2 driving (see What Do Self-Driving Levels Mean?). This essentially means that the driver is required to pay attention at all times and have control over the car. While the car may be doing most of the work, there are plenty of unforeseen circumstances that may occur, that the system just can’t handle. In a nutshell, Autopilot in Tesla parlance means that the car can steer itself on low curvature roads with clear lane markings and automatically accelerate and decelerate with traffic, all the way from freeway speeds down to stop-and-go traffic. Note that this self-driving capability, simply called ‘Autopilot’ is an optional feature called (see this Autopilot article for what’s standard and what’s not). For a full breakdown of all the current Autopilot and Full Self-Driving features, see the full Autopilot review article here. Tesla updates Autopilot features by updating hardware every year or two, or more frequently updating software. Hardware, by definition, includes all the built-in sensors such as cameras, radar and computing systems. Hardware is updated much less frequently (every one or two years) than software and is generally called Hardware 1 (or Autopilot 1 or AP1), Hardware 2 (AP2), etc. Software updates happen much more frequently (every month or two) and include new features the the entire vehicle, not just Autopilot updates. These software updates are usually called something like Version 7.0, Version 7.1, Version 9, etc. This articles will be focused on the hardware updates (e.g. AP1 vs AP2). The original Tesla Autopilot system with semi self-driving capabilities was released in October of 2014 and available on the Model S, and later on the Model X. It was offered as part of the “Tech Package” and was a joint development between Mobileye (since acquired by Intel) and Tesla. It featured a single front-facing camera and radar to sense the environment plus Mobileye’s hardware and software to control the driving experience. At the time, it was one of the most sophisticated systems on the market and pushed the envelope in terms of what such a system could do on a consumer vehicle. In fact, it was so good that when Tesla decided to build their own system, it took them years to catch up to the baseline Autopilot functionality in AP1. AP1 vehicles were produced from 2014 to 2016. 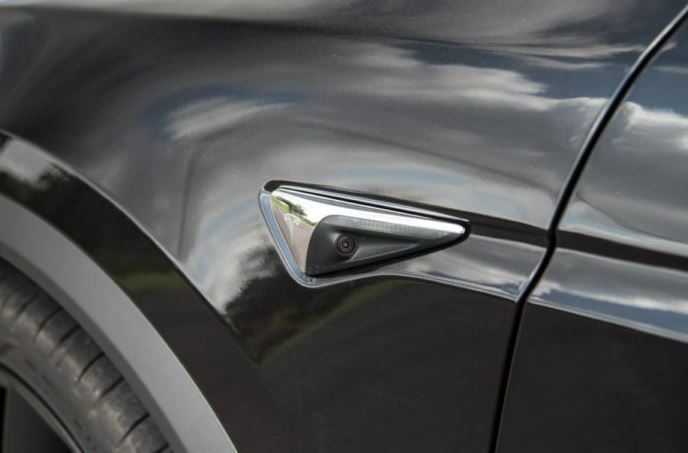 In addition AP1 Tesla Vehicles will have a single front-facing camera above the rearview mirror on the front windshield (if it’s missing, the vehicle does not have Autopilot hardware at all). Tesla announced it would be parting ways with with Mobileye in July 2016 and begin developing its own self-driving Autopilot solution. Tesla felt that Mobileye was not moving quickly enough and that there was room for opportunity to provide greater self-driving features by using machine learning / neural networks which were coming of age at the time. In late 2016 Tesla began rolling out vehicles with Hardware 2, called AP2. A major change from before was that all vehicles would now come standard with Autopilot-ready hardware and that customers could either buy Enhanced Autopilot upfront (at a discount) or activate it later over-the-air for a slightly higher price. The new hardware included a powerful NVIDIA AI computer, more cameras that covered all sides of the vehicle for a 360 view, and better radar and ultrasonic sensors. Tesla was clearly signaling with this new hardware platform that machine learning / neural networks based primarily on camera inputs were the future. This was a big bet and luckily for Tesla, neural networks had advanced to the point where self-driving using a visual-based neural network had become feasible. One big issue was that, at the time, Tesla’s neural network software was not yet up-to-par with Mobileye’s solution, so customers who purchased vehicles had inferior Autopilot experience until late 2017, when the software finally caught up with Mobileye. Ironically, one small item missing from AP2 hardware was rain-sensing windshield wiper sensor. Tesla decided to simply use the cameras the neural network to sense rain instead of using a dedicated. Well, since Tesla was so busy getting Autopilot up to par with Mobileye, it delayed the rain sensor capability until much later (and comically, it’s still in ‘beta’ today). AP2 Tesla vehicles were produced from late 2016 onward. So what’s the difference between AP1 and AP2? A lot. These are two completely different hardware and software (at least for the self-driving portion) systems. The AP1 hardware is limited to only one forward-facing camera and radar, while AP2 have eight cameras surrounding the vehicle for full 360 vision. This will, of course, allow for much greater environmental and situational awareness of the vehicle, for example, allowing the system to see whether there is a car or bicyclist in the adjacent lane. Additionally, the radar and ultrasonic sensors were improved for longer-range sensing. The AP1 platform was powered by Mobileye’s EyeQ3 platform which is essentially a hard-coded system to recognize objects. Tesla worked with Mobileye to enhance it for its vehicles, but it could only be pushed so far. On the other hand, the AP2 platform uses the NVIDIA DRIVE PX 2 computing hardware which is a powerful GPU designed for machine learning and neural networks. They are two completely different systems not compatible with one another and Tesla will not be updating AP1 much longer. Since the AP1 platform is completely different, it will not be updated much longer. Tesla’s focus is on AP2 and beyond. If you want the latest and greatest Enhanced Autopilot, be sure to purchase an AP2 vehicle. If you just want basic adaptive cruise control with steering assist, then AP1 is fine. Tesla released a minor update to the AP2 hardware suite in mid-July of 2017, coined AP2.5 (although, not officially by Tesla). It included an updated forward radar with slightly longer range (558 ft / 170 m) and the NVIDIA DRIVE PX 2 with secondary node enabled (for redundancy). It was a relatively minor update and doesn’t appear to have any discernible functional benefits currently. In late 2018, Tesla announced it is developing its own processing Hardware to replace the NVIDIA DRIVE PX 2 it was using previously. Tesla now calls Hardware 3 (AP3), the Full Self-Driving Computer, or FSD Computer, for short. This allows for 10X the current processing power and cheaper costs to produce. Current AP2 owners will be able to upgrade their NVIDIA cards to Tesla hardware (free for those who ordered Full Self-Driving or an extra charge for those who didn’t). It’s expected that AP3 will start rolling out to cars in mid-2019. The FSD Computer (aka Hardware 3 / AP3) began shipping in all Tesla vehicles in late April of 2019. Upgrades for customers with AP2 who purchased FSD, will come later in 2019. Now that Tesla has consolidated its Autopilot options, it’s clear that the Full Self-Driving (FSD) option will be the primary beneficiary of Hardware 3.0 (AP3) improvements. Expect to see ever-increasing autonomous capabilities being slowly rolled out to Tesla vehicles with that option (anyone who purchases FSD will also receive Hardware 3.0). With powerful custom hardware and dedicated AI software to match, 2019 and 2020 should interesting years for Tesla Autopilot Full Self-Driving capabilities. Tesla detailed much of this during their Autonomy Day for investors, including the Tesla Network for ride hailing and using Model 3s as ‘Robo Taxis’. Check out the Tesla Autonomy Day article for an in-depth look Tesla Autopilot and Full Self-Driving capabilities and learn more about what’s available today in our full Autopilot and Full Self-Driving review article plus Future Autopilot updates coming soon.